Members of the 3rd Bomb Group rang in 1944 a little differently in New Guinea than they would have back in the States. Despite not having friends and family to celebrate with, they still managed to have a good time. This post will probably look familiar to longtime readers. 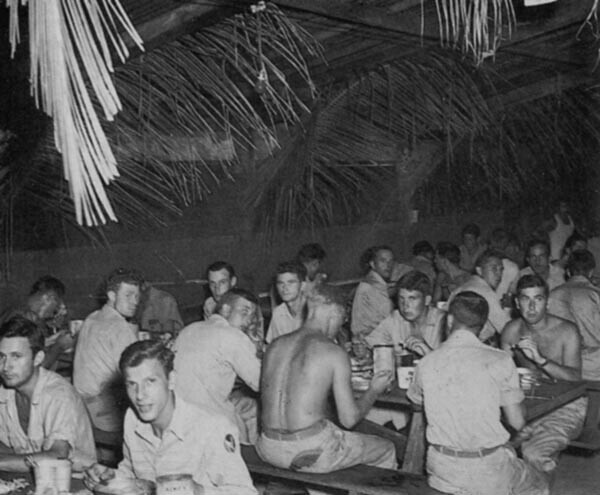 Men from the 500th Bomb Squadron, 345th Bomb Group enjoy a turkey dinner on December 25, 1944 at Dulag. For the men of Fifth Air Force, Christmas was not necessarily a time to take the day off to celebrate the holiday. There were still missions to be flown as the Allies tried to take back the Pacific from the Japanese. Some of these missions, like those of the 386th Squadron (312th Bomb Group) in 1943 were patrol missions. While the 386th was on patrol that year, the 345th, 43rd and 38th Bomb Groups were participating in a major raid on Cape Gloucester. Three days before bombing Cape Gloucester on the 25th, a 345th B-25, THUMPER, was shot down on a mission over Wewak. The plane crash landed 12 miles from Dumpu, with the crew coming out of the crash uninjured. For five days, the crew trekked along the Ramu River, with a batch of P-40s spotting the men on Christmas Eve. The next day, the crew was seen by a Stinson L-5. The crew aboard the plane dropped supplies for the THUMPER crew. Later that afternoon, the crew received more supplies including ten pounds of turkey and a few other treats for Christmas. They were rescued the following day. Whether or not any particular group was on a mission varied by year. No matter what, there were always a few hours set aside to enjoy a turkey or ham dinner, attend mass, and enjoy some music. Even though the men were so far away from home during the holidays, they always made the best of the situation. 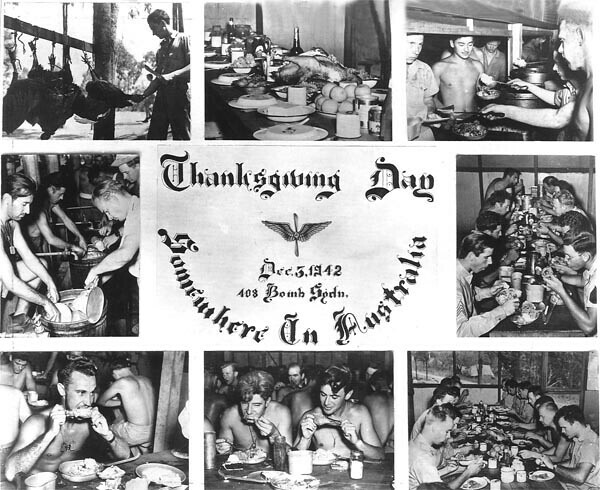 The 22nd Bomb Group’s 408th Squadron celebrates a late Thanksgiving on Dec. 3, 1942.